When not in use, the case is awkward to store and seems to require delicate handling while traveling. It may not hurt it, but I wouldn’t want to fold the case to pack it only to find an unsightly crease stuck in the plastic or for some reason to find the seam compromised where the fold was. 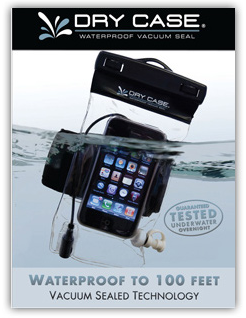 For a more permanent waterproof iPhone case check out the LifeProof Case. UPDATE: Check out this great and in-depth (ha ha) review by Bob at Vagabond3.com. This entry is filed under: Blog, Review, Technology, Water.